The Pyrénées-Orientales is located deep in the heart of Catalan country, within the Languedoc-Roussillon region. 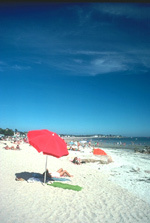 It is also France's most southern department and covers 4183 square kilometres. This department makes up the 'Roussillon' part of the name. 'Languedoc', meanwhile, refers to an ancient language called d'Oc. The Pyrénées-Orientales receives a significant number of tourists. Its excellent year round climate is so renowned that Cerdagne has become the European capital of solar power research and development. The Pyrénees-Orientales contains an impressive mix of landscapes. There are over 106,000 hectares of forest. The west is predominantly mountainous, with peaks reaching heights of almost 3000m. In the east, however, there are vast plains covered with lakes. The Mediterranean coast is, not surprisingly, the most visited area. Between Barcares and Argeles you will find long sandy beaches, whilst between Collioure and Cerbere there is a rocky coastline. It takes about three hours to cross the department by car. The Spanish owned this area until 1659, when the French took Roussillon and turned it into the department we know today. You can still see its Spanish influence in the names of towns and local dialects. The local enthusiasm for bullfighting and paellas is also a giveaway! Having such a high sunshine record means that the department is always the first to produce the year's fruit - a trait much appreciated by the wine industry. The departmental capital is Perpignan. This relaxing town has had a rather interesting history. In its heyday it was the capital of the Kingdom of Mallorca. Today it is the third largest Catalan city, after Barcelona and Lleida (both in Spain). The town, which lies between two rivers, is well looked after with its immaculate parks and boulevards. Just to the south-west of Perpignan, you will find Ceret, a small town with just 8000 inhabitants. Many visitors are drawn to its Museum of Modern Art. It is also a great place to watch bull fighting. Collioure is to be found on what is known as the Vermillion Coast. It is a picturesque port nestled between the vineyards and the crashing waves of the sea. Prades is in the east of the department and boasts a fantastic Romanesque church. 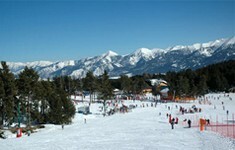 The Pyrénées-Orientales has its own ski resorts, including Font Romeu, Les Angles, Pyrenees 2000, Bolqueres and Puyvalador, all offering good, value-for-money skiing. And in the late spring and early summer, hiking and pony trekking are a popular pastime in these more mountainous areas. French is the only official language, although Catalan is widely used. You may find the thick accent quite hard to understand but don't worry because the locals are well-known for their friendliness and willingness to help out foreigners. Perpignan has its own airport, which has regular flights from both Ryanair and Flybe. If you'd prefer to go by train the super-fast TGV train service will also take you there in comfort. The Languedoc-Roussillon is a reasonably expensive place in which to own property with prices rising every year. Perpignan is the most fashionable location and so is quite costly. However, further inland you are likely to find many more bargains, with property in the Pyrénées also fairly priced. Do you know Pyrénées-Orientales better than we do? Do you have photos of Pyrénées-Orientales? The Pyrénées-Orientales is located in the very south of the Languedoc-Roussillon region of south-west France. It lies on the border with Spain.